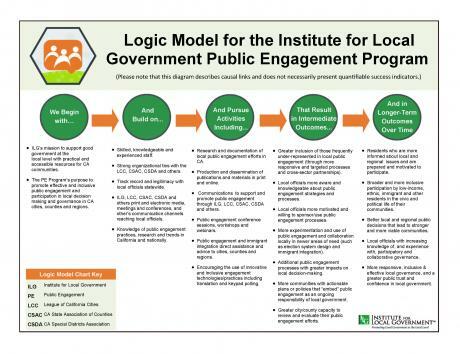 The Public Engagement Program’s logic model represents a sound theoretical basis for the program activities. The model includes a range of activities needed to support meaningful public engagement in local government decisions. The Public Engagement Program uses the model to set goals, measure outcomes, collect data, evaluate the program’s components and articulate impact. 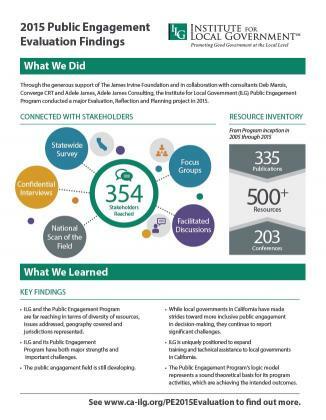 Through the generous support of The James Irvine Foundation and in collaboration with consultants Deb Marois, Coverge CRT and Adele James, Adele James Consulting, the Institute for Local Government (ILG) Public Engagement Program conducted a major Evaluation, Reflection and Planning Project in 2015. 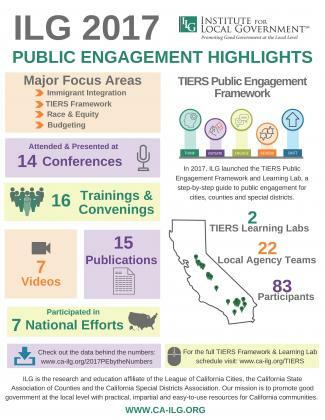 This infographic summarizes the accomplishments of ILG’s Public Engagement Program in 2017. Please see the companion document 2017 Behind the Numbers for more information about the program’s activities. 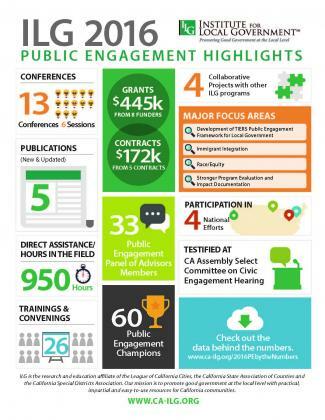 This infographic summarizes the accomplishments of ILG’s Public Engagement Program in 2016. Please see the companion document 2016 Behind the Numbers for more information about the program’s activities. 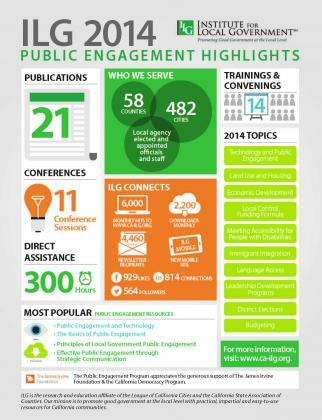 This infographic summarizes the accomplishments of ILG’s Public Engagement Program in 2014. Please see the companion document 2014 Behind the Numbers for more information about the program’s activities.